Perry Suspenders feature the patented Perry Hook, in place of clips or buttons. Unlike conventional suspenders, which are notorious for popping off, Perry Suspenders will not come off until you take them off. Perry Suspenders attach to your belt using the patented Perry Hooks that allow you to slide your belt through the suspender hooks. 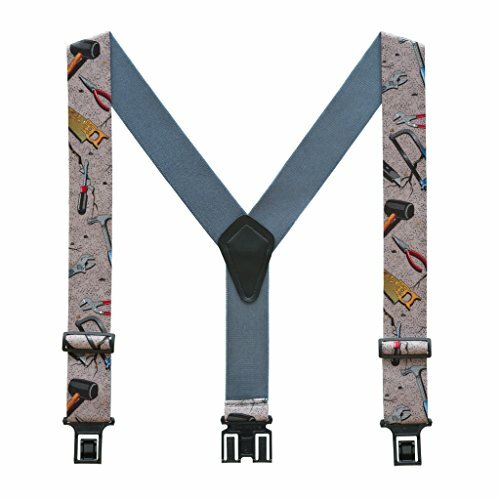 As a result: the suspenders will not slide off, clips will not effect the material of your pants, and it keeps your belt from sagging. Key Features: 2" wide elastic straps are adjustable to ensure the perfect fit. Available in Regular (up to 48") and Tall (up to 54"). Featuring a Handyman/Carpenter themed print - show your profession with pride. To make sure you get the right fit, measure diagonally from the rear of your waist band, over your shoulder to the front of your waistband. Round up to the next higher size. Remember, suspenders can be shortened but not lengthened. 2 Inches Wide with X-Back Construction. Leather Crosspatch Embossed with Perry Logo. If you have any questions about this product by Perry Suspenders, contact us by completing and submitting the form below. If you are looking for a specif part number, please include it with your message.